Fragmentum torei Marae, modo Gandharensi factum, in Valle Swat inventum. Daemones Marae. Manuscriptum folii palmae. Nalanda civitatis Bihar Indiae. Mara Buddham insidiatur, aniconica repraesentatio: Buddha solum a solio repraesentatur. 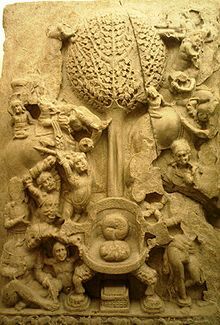 Saeculo secundo, Amaravati Indiae. Mara modo Birmanensi pictus, Buddham temptare conans. Mara (Sanscritice māra; Mandarinice 魔; Tibetanice Wylie bdud; lingua Khmer មារ; Birmanice မာရ်နတ် ; Thai มาร; Singhalensice මාරයා), in Buddhismo est daemon quod Gautamam Buddham temptavit, ad eum illicendum conans visione mulierum pulchrarum, quae in variis legendis saepe dicuntur filiae Marae. In cosmologia Buddhistica, Mara imprudentes animi impetus, mentem imperitum, et mortem vitae spiritualis in personam suam constituit. Tentator est, qui homines a vita spirituali distrahit per blandimenta rerum mundanorum, vel faciens ut res malae bonae videantur. ↑ Vide, exempli gratia, SN 4.25, "Māra's Daughters" (Bodhi, 2000, pp. 217-20), et Suttanipata 835 (Saddhatissa, 1998, p. 98). In each of these texts, Mara's daughters (Māradhītā) are personified by sensual Craving (taṇhā), Aversion (arati) and Passion (rāga). ↑ Mara-the god of death. Bodhi, Bhikkhu, conv. 2000. The Connected Discourses of the Buddha: A Translation of the Samyutta Nikaya. Bostoniae: Wisdom Publications. ISBN 0861713311. Boyd, James W. 1971. Symbols of Evil in Buddhism. The Journal of Asian Studies 31(1):63–75. JSTOR. Guruge, Ananda W. P. 1991. The Buddha's encounters with Mara, the Tempter: their representation in Literature and Art. Indologica Taurinensia 17-18:183–208. PDF. Saddhatissa, H., conv. 1998. The Sutta-Nipāta. Londinii: RoutledgeCurzon Press. ISBN 0700701818. "The Buddha's Encounters with Mara the Tempter: Their Representation in Literature and Art." Novissima mutatio die 26 Iulii 2016 hora 18:57 facta.